Papertrail is a cloud-based logs management system to which you can export any type of logs and activity logs. The idea is to have all the logs and information centralized in one place. 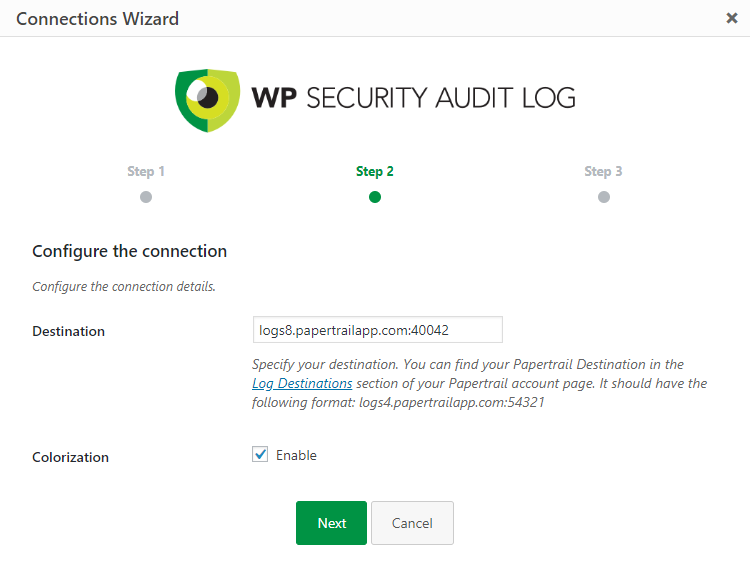 This document explains how to integrate the WP Security Audit Log plugin with Papertrail to mirror (export) the activity logs of WordPress sites to it. Click on DB/Archive/Mirror node in the plugin menu. Click the Create a Connection button to launch the connection setup wizard. Select Papertrail from the Type of Connection drop down menu in the first step of the wizard. Enable or disable colorization. When enabled different colours are used for different sections of the logs for better readability. In the last step of the wizard, specify a name for the connection. Connection names are just reference for you and can be up to 25 characters long and can only consist of letters, numbers and underscores. Click on DB/Archive/Mirror in the plugin menu. Navigate to the Mirroring tab and click the Setup an Activity Log Mirror button. In the first step of the wizard specify a name for the mirror. Names are just for your reference and can be 25 characters long, and only consist of letters, numbers and underscores. Select the Papertrail connection you’ve just setup from the Connection drop down menu. In the second step of the wizard specify how often the activity log mirroring process should run. In the last step of the wizard you can configure activity log filtering rules for the mirroring connection. By default the connection is set to Send all events option, though if you’d like to setup any filtering rules refer to configuring filtering rules for activity log mirroring connections. Click Save mirror to save the new mirroring process. Refer to the getting started guide for external databases & third party services for more information on other integrations and activity log management.